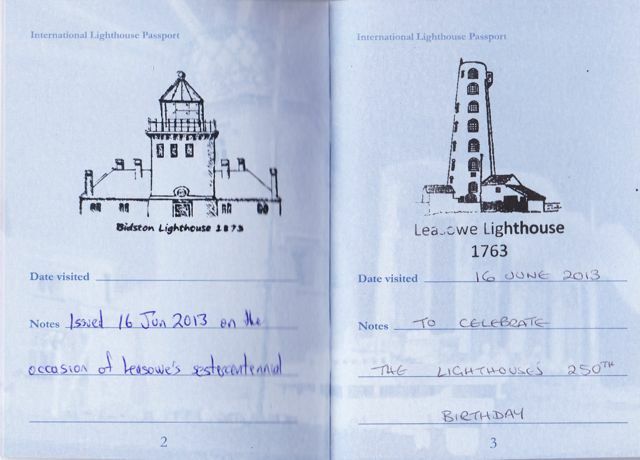 The International Lighthouse Passport scheme was launched last year by Lizard Lighthouse Visitor Centre. Similar schemes have proved popular in North America. Passport holders collect ink stamps from lighthouse visitor centres. Each page has space for one lighthouse stamp and additional notes so that you can also use it to keep a record of your visits. 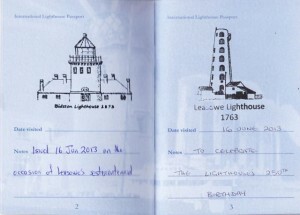 Lighthouse Passport with stamps for Bidston and Leasowe. In Wirral, Bidston, Leasowe and Hilbre Island Lighthouses all have lighthouse stamps and limited stocks of lighthouse passports for sale. The Association of Lighthouse Keepers maintain a full list of lighthouses with passport stamps. 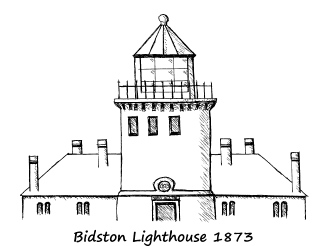 The passport stamp for Bidston Lighthouse is based on a line drawing by Phil Ryder. Thanks, Phil. This entry was posted in Lighthouse, News and tagged BidstonLighthouse, lighthouse, passport on 23rd March 2014 by admin. We have run out of stock of these Lighthouse Passports, but nearby Leasowe Lighthouse and Hilbre Island might have some left.